Hilary Bonnell was a “regular teenager” who was kind hearted, funny and beautiful, Fillier says of her only daughter. “The last Christmas we had together, she had said she didn’t even know what to ask for because she had everything. It made me feel so good to hear that from her,” says Fillier. 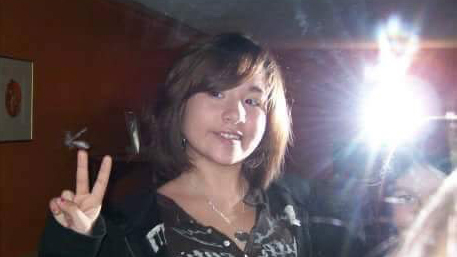 Hilary, from the Esgenoopetitj First Nation in New Brunswick, disappeared on Sept. 5, 2009. She was murdered by her cousin Curtis Bonnell, who sexually assaulted her and buried her body. Fillier says her daughter was brave. Hilary loved swimming and would go tubing down a river with her family. At 15, she jumped off a bridge into the water. She liked a lot of music, including older bands like the Rolling Stones, but not country music. Hilary and her mother would sing together and karoake. Hilary had many friends. She didn’t like it when her mother told her to get offline because it was a school night. She also loved the food her mother and stepfather cooked for her. Baby clams wrapped in bacon, lobster and Doritos were her favourite foods. But her most favourite dish was poutine from Raymonds restaurant. “She was so small but she could eat a family size poutine,” says Fillier. When Hilary’s friends graduated, it was a reminder for Fillier of all of the things her daughter would never get to experience. She wonders what Hilary’s life would’ve been like. Would she be married? Would she have children? Would she be happy? This profile was produced as part of a partnership between The Signal and Kukukwes.com ahead of the national inquiry into missing and murdered Indigenous women and girls.